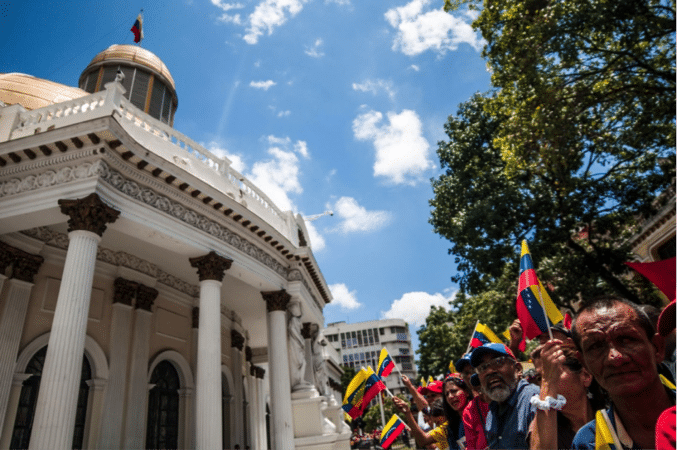 MR Online | Venezuela’s embarrassment of riches? Just a few years ago, it was common for intellectuals associated with Latin America’s twenty-first century processes to discuss what seemed to be an urgent problem. Their worry was that the very success of these processes of change, such as Venezuela’s Bolivarian Revolution and Ecuador’s Citizens’ Revolution, had resulted in a new group of people rising to middle-class status. The problem was that this group (officially called “The new middle class of popular origin”) would inevitably develop an expanded set of aspirations. Instead of subsidized food and basic medicine, they would soon desire cars, trips to foreign countries, access to products from Amazon, etc. How would the revolution satisfy this new set of desires? Could this emerging social group—which was a product of the revolution and had benefited from its generosity—be kept content (and voting favorably! ), given its new status? How times have changed! Now, of course, no one remembers this concern that circulated widely just a few years ago, because the grueling economic crisis that these countries experienced has almost completely wiped the worry away. What seemed like an urgent problem went up in smoke—due to the crushing crisis—along with the whole middle-class status of this emerging group! In its place arose a completely different concern. No longer was the worry how to get cars, smartphones and apartments to the new middle-class of popular origin. No, the pressing problem had become how to avoid the imminent danger that this now very precarious group would bury the progressive governments alive with its increasingly fascist expressions of anger! This comeuppance that history gave to a certain intellectual circuit may seem to be of little importance. Perhaps in the end it could be seen just as a lesson in how quickly we forget things. After all, as a social sector, intellectuals are notoriously prone to error and especially to focusing on the wrong problem at the wrong time. Yet things are not so simple. In reality, this error of perception—which came to circulate widely in progressive media channels and internet sites and was voiced in numerous panel discussions organized for Leftist intellectuals—reaches deeply into the nature of the Latin American processes of change themselves and how they were conceived by many of the people who led and accompanied the movements. What Chávez did not anticipate was that capitalism—in perhaps its most impressive crisis—would pull the rug out from under itself and almost everyone in the neighborhood. That is to say, Chávez was prepared to do battle with capitalism in its “healthy” mode, but not in its crisis mode. Everything points to how the late Venezuelan president came to think that the struggle to build socialism in the twenty-first century would be like a race. Which could go further, capitalism or socialism? How well would socialism compete with capitalism? Could it out-run or out-produce capitalism? It seems that what Chávez wasn’t prepared for was the possibility that, midway through the race, capitalism would cut its own throat and then reinvent the rules of the game. In effect, this is the only way to understand why Chávez continued to indebt the country during the whole oil boom or why he launched, a few years after the global crisis began, the project Gran Misión Vivienda Venezuela. Again, it is the only way to explain why he invested so much effort and so many resources into a cost-heavy oil project like the one in the Faja del Orinoco. All of this overconfidence continued, even after the crisis broke out in the North’s financial sector and despite the rug having been pulled out from the old way of doing things some years previously. The most profound theoretical and practical question at stake here is whether you can rely on capitalist value in the transition to socialism. If you are going to build your socialism on the basis of capitalist value, you are constrained by the rules of the game: reliance on market exchange, reified social relations (based on products rather than coordinated activities), and a quantity-based conception of economic progress. Letting the law of value govern one’s society makes building socialism almost impossible. That is because, even if the general guidelines of capitalist value might seem to be acceptable when the capitalist “going is good” and the market still functional, all it takes is for the market to plunge for you to lose your bearings entirely. That, in turn, is because they are not your bearings but rather capitalism’s. Then the project finds itself unable to motivate people, except with money and material incentives, which it now cannot offer. Again, it finds itself trying to import goods from the outside with a petrodollar that is unspeakably scarce. Finally, the project discovers that most militants and allies only speak the used up language of material incentives—allowed for pragmatic reasons to become the movement’s lingua franca. We only need to look at the last stage of this contradictory trajectory—Maduro’s way of governing—to see very clearly what it leads to. Today the Chavist project apparently continues to plow forward according to the criteria of capitalist value: everything is “full steam ahead” in the official discourse, but the train cars behind the government’s locomotive are mostly empty, ghost cars. Maduro was undoubtedly an honest student of Chávez in the sense that he thought that the transition to socialism would be a matter of going from summit to summit. Hence he has continued to proceed in that manner even when the summits became, faute de mieux, fictional ones. Yet there is an error of perception here that has informed the whole context. It is the failure to see that socialism is not “bigger” than capitalism, but rather is based on different criteria. Most especially, it has different motivations. Che Guevara said you cannot construct socialism with the worn out (melladas) arms of capitalism. In other words, as Thoreau said—referring to an apparently more individualistic project—you need to march to the beat of your own drummer.